Pastels are perpetually pretty spring shades, and this season they’re especially popular in everything from casual t-shirts and tank tops to bridesmaid’s dresses. While these colors are undeniably refreshing, a piece of jewelry in a light hue can sometimes get lost in a pastel-heavy ensemble. Richly-colored jewelry in cool colors, such as London blue topaz rings, can provide the perfect counterpoint to the lighter hues of spring. 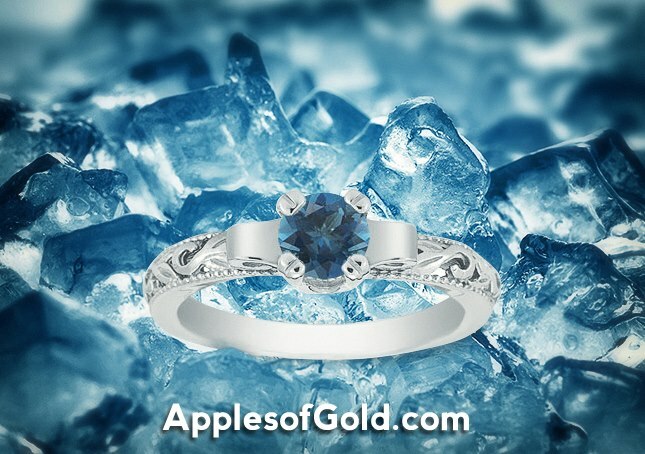 As the deepest shade of blue topaz, London blue topaz displays a rich color that’s brighter than that of the classic blue precious gemstone, the sapphire. London blue topaz jewelry has a sparkle that’s sophisticated and bright, with a saturated hue that’s never gray or dull. The vibrant, classy glimmer of these pieces makes them the perfect partners for the season’s pastels. If you’d like to partner a classic look with your spring ensembles, try a London blue topaz solitaire ring or a three-stone style such as the Three Stone London Blue Topaz and Diamond Ring in 14K White Gold. 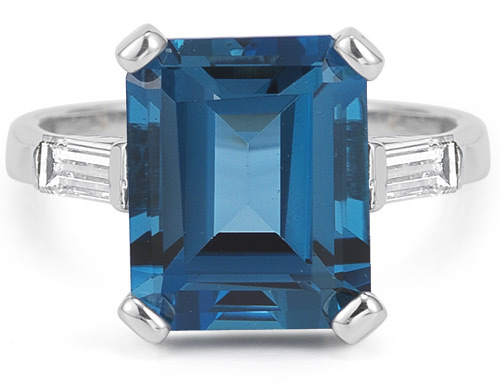 This timelessly-styled piece places a 4mm round London blue topaz in between two slightly smaller round diamonds, creating gorgeous contrast between rich color and colorless dazzle. A sleek, shining 14K white gold bands displays these stones simply and elegantly, allowing the beauty of these gems to take the spotlight. If you’d prefer a bolder look to contrast your seasonal styles, don’t miss the 5 Carat Emerald-Cut London Blue Topaz and Diamond Ring! 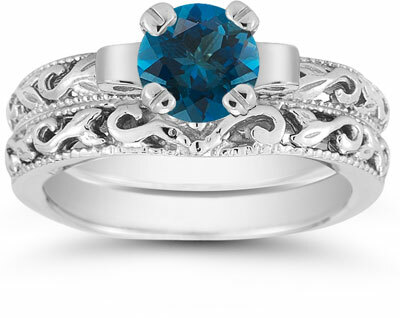 This piece utilizes the same eye-catching contrast as the aforementioned three-stone ring, but it features a much larger dose of rich blue glimmer. A five-carat London blue topaz, over a centimeter high, draws attention as the centerpiece of this ring, while two 0.15-carat baguette-cut diamonds accent it on either side. This bold design’s classic shapes and gorgeously-colored sparkle give it enduring appeal. 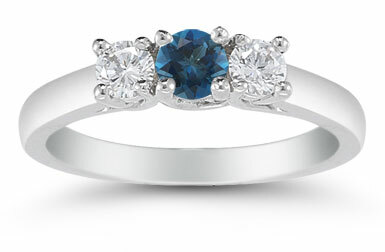 London blue topaz is also gorgeous in vintage-inspired rings as it brings a bold, modern hue to time-honored styles. Antique-style rings are already excellent partners for spring floral patterns, and when they’re set with a deep, vibrantly-colored stone such as London blue topaz, they also provide lovely contrast. The 1 Carat London Blue Topaz Art Deco Ring is a gorgeous example of vintage London blue topaz style. A glimmering round 1-carat London blue topaz is set within the gleaming petals of a 14K white gold lotus flower that rises elegantly from a meticulously-crafted band. Intricately-carved leaf and swirl motifs adorn this band, calling to mind the decorative designs of the 1920s.This exquisite ring could serve as a stunning engagement ring as well as a unique fashion piece; it’s also available with a coordinating wedding band in the 1 Carat London Blue Topaz Art Deco Bridal Ring Set in 14K White Gold, one of several London blue topaz engagement and wedding ring sets carried by Apples of Gold. This season may be known for light hues, but a richly-colored ring can provide just the right touch of contrast. Try one of these London blue topaz rings to complement your spring pastels.